Exeter City booked their place in the League Two play-offs with an impressive 3-1 victory over long-time leaders Doncaster at the Keepmoat Stadium. Goals from Jordan Moore-Taylor, David Wheeler and Liam McAlinden were enough for Exeter to condemn Doncaster to a third straight defeat which saw them slip to second place in the table behind Plymouth. 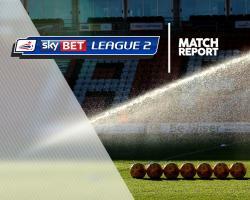 James Coppinger volleyed Doncaster level but they endured a frustrating second half attempting to break Exeter down. Moore-Taylor smashed in a 30-yard thunderbolt after 16 minutes, but Rovers were level in 26th minute when Coppinger finished well from a tight angle. They were awarded a penalty when Joe Wright handled on the line and although Ryan Harley saw his spot-kick saved by Ian Lawlor, Wheeler drilled in the rebound. The win was sealed in the 87th minute when Ollie Watkins squared for substitute McAlinden to score.